Azure Traffic Manager には、エンドポイントの監視と自動フェールオーバーの機能が組み込まれています。Azure Traffic Manager includes built-in endpoint monitoring and automatic endpoint failover. この機能を使用して、Azure リージョンの障害を含むエンドポイント障害に対する回復性を備えた高可用性アプリケーションを提供できます。This feature helps you deliver high-availability applications that are resilient to endpoint failure, including Azure region failures. プロトコル。Protocol. Traffic Manager がエンドポイントをプローブして正常性をチェックするときに使用するプロトコルとして、HTTP、HTTPS、または TCP を選択します。Choose HTTP, HTTPS, or TCP as the protocol that Traffic Manager uses when probing your endpoint to check its health. HTTPS 監視では、SSL 証明書の存在だけがチェックされ、その証明書が有効かどうかは検証されません。HTTPS monitoring does not verify whether your SSL certificate is valid--it only checks that the certificate is present. Port。Port. 要求に使用するポートを選択します。Choose the port used for the request. パス。Path. この構成設定は、パス設定を指定する必要がある HTTP プロトコルと HTTPS プロコルでのみ有効です。This configuration setting is valid only for the HTTP and HTTPS protocols, for which specifying the path setting is required. TCP 監視プロトコルにこの設定を指定するとエラーになります。Providing this setting for the TCP monitoring protocol results in an error. HTTP および HTTPS プロトコルの場合は、監視でアクセスされる Web ページまたはファイルの相対パスと名前を指定します。For HTTP and HTTPS protocol, give the relative path and the name of the webpage or the file that the monitoring accesses. スラッシュ (/) は、相対パスの有効なエントリであり、A forward slash (/) is a valid entry for the relative path. ファイルがルート ディレクトリ (既定値) にあることを示します。This value implies that the file is in the root directory (default). カスタム ヘッダーの設定 この構成設定は、Traffic Manager がプロファイルのエンドポイントに送信する正常性チェックに特定の HTTP ヘッダーを追加するうえで役に立ちます。Custom header settings This configuration setting helps you add specific HTTP headers to the health checks that Traffic Manager sends to endpoints under a profile. カスタム ヘッダーは、プロファイル レベルおよびエンドポイント レベルで指定できます。プロファイル レベルで指定すると、そのプロファイルのすべてのエンドポイントに適用され、エンドポイント レベルで指定すると、エンドポイントにのみ適用されます。The custom headers can be specified at a profile level to be applicable for all endpoints in that profile and / or at an endpoint level applicable only to that endpoint. カスタム ヘッダーを使用すると、ホスト ヘッダーを指定することで、マルチテナント環境のエンドポイントに対する正常性チェックを目的の場所に正しくルーティングできます。You can use custom headers for having health checks to endpoints in a multi-tenant environment be routed correctly to their destination by specifying a host header. Traffic Manager からの HTTP (S) 要求を特定し、それを別の方法で処理するために使用できる一意のヘッダーを追加することで、この設定を使用することもできます。You can also use this setting by adding unique headers that can be used to identify Traffic Manager originated HTTP(S) requests and processes them differently. コンマで区切られたヘッダーと値のペアを最大 8 つ指定できます。You can specify up to eight header:value pairs seprated by a comma. たとえば、"header1:value1、header2:value2" です。For example, "header1:value1,header2:value2". 予測される状態コード範囲 この設定を使用すると、200-299、301-301 という形式で複数の成功コードの範囲を指定できます。Expected status code ranges This setting allows you to specify multiple success code ranges in the format 200-299, 301-301. 正常性チェックが開始されたとき、これらの状態コードをエンドポイントから応答として受け取ると、そのエンドポイントは、Traffic Manager によって正常としてマークされます。If these status codes are received as response from an endpoint when a health check is initiated, Traffic Manager marks those endpoints as healthy. 指定できる状態コードの範囲は 8 個までです。You can specify a maximum of 8 status code ranges. この設定は、HTTP と HTTPS プロトコルのみ、およびすべてのエンドポイントに適用できます。This setting is applicable only to HTTP and HTTPS protocol and to all endpoints. この設定は Traffic Manager プロファイル レベルであり、既定では成功の状態コードとして 200 という値が定義されています。This setting is at the Traffic Manager profile level and by default the value 200 is defined as the success status code. プローブ間隔。Probing interval. この値により、Traffic Manager プローブ エージェントによってエンドポイントの正常性がチェックされる頻度を指定します。This value specifies how often an endpoint is checked for its health from a Traffic Manager probing agent. ここで、30 秒 (普通のプローブ) と 10 秒 (速いプローブ) という 2 つの値を指定できます。You can specify two values here: 30 seconds (normal probing) and 10 seconds (fast probing). 値が指定されていない場合、プロファイルによって既定値の 30 秒に設定されます。If no values are provided, the profile sets to a default value of 30 seconds. 高速プローブの料金の詳細については、「Traffic Manager の価格」をご覧ください。Visit the Traffic Manager Pricing page to learn more about fast probing pricing. 障害の許容数。Tolerated number of failures. この値により、Traffic Manager プローブ エージェントがそのエンドポイントを異常としてマークするまでに許容されるエラーの数を指定します。This value specifies how many failures a Traffic Manager probing agent tolerates before marking that endpoint as unhealthy. 0 ～ 9 の値を指定できます。Its value can range between 0 and 9. 値が 0 の場合、監視エラーが 1 つ発生すると、そのエンドポイントが異常とマークされます。A value of 0 means a single monitoring failure can cause that endpoint to be marked as unhealthy. 値が指定されていない場合は、既定値の 3 が使用されます。If no value is specified, it uses the default value of 3. プローブのタイムアウト。Probe timeout. このプロパティでは、正常性チェックのプローブがエンドポイントに送信されたときに、そのチェックが失敗と見なされるまでの Traffic Manager プローブ エージェントの待機時間を指定します。This property specifies the amount of time the Traffic Manager probing agent should wait before considering that check a failure when a health check probe is sent to the endpoint. プローブ間隔が 30 秒に設定されている場合は、5 ～ 10 秒のタイムアウト値を設定できます。If the Probing Interval is set to 30 seconds, then you can set the Timeout value between 5 and 10 seconds. 値が指定されていない場合は、既定値の 10 秒が使用されます。If no value is specified, it uses a default value of 10 seconds. プローブ間隔が 10 秒に設定されている場合は、5 ～ 9 秒のタイムアウト値を設定できます。If the Probing Interval is set to 10 seconds, then you can set the Timeout value between 5 and 9 seconds. タイムアウト値が指定されていない場合は、既定値の 9 秒が使用されます。If no Timeout value is specified, it uses a default value of 9 seconds. 監視プロトコルが HTTP または HTTPS に設定されている場合、Traffic Manager プローブ エージェントは、指定されたプロトコル、ポート、相対パスを使用してエンドポイントに対して GET 要求を行います。If the monitoring protocol is set as HTTP or HTTPS, the Traffic Manager probing agent makes a GET request to the endpoint using the protocol, port, and relative path given. 200-OK 応答、または予測される状態コードの範囲で構成された応答が返された場合、そのエンドポイントは正常と見なされます。If it gets back a 200-OK response, or any of the responses configured in the Expected status code *ranges, then that endpoint is considered healthy. 応答が別の値である場合や、指定されたタイムアウト期間内に応答を受信しなかった場合、Traffic Manager プローブ エージェントは、[障害の許容数] 設定に従って再試行します (この設定が 0 の場合、再試行は行われません)。If the response is a different value, or, if no response is received within the timeout period specified, then the Traffic Manager probing agent re-attempts according to the Tolerated Number of Failures setting (no re-attempts are done if this setting is 0). 連続エラーの数が [障害の許容数] 設定を上回った場合、そのエンドポイントは異常とマークされます。If the number of consecutive failures is higher than the Tolerated Number of Failures setting, then that endpoint is marked as unhealthy. 監視プロトコルが TCP の場合、Traffic Manager プローブ エージェントは、指定されたポートを使用して TCP 接続要求を開始します。If the monitoring protocol is TCP, the Traffic Manager probing agent initiates a TCP connection request using the port specified. 接続を確立するために、エンドポイントが要求に応答すると、その正常性チェックは成功とマークされ、Traffic Manager プローブ エージェントは TCP 接続をリセットします。If the endpoint responds to the request with a response to establish the connection, that health check is marked as a success and the Traffic Manager probing agent resets the TCP connection. 応答が別の値である場合や、指定されたタイムアウト期間内に応答を受信しなかった場合、Traffic Manager プローブ エージェントは、[障害の許容数] 設定に従って再試行します (この設定が 0 の場合、再試行は行われません)。If the response is a different value, or if no response is received within the timeout period specified, the Traffic Manager probing agent re-attempts according to the Tolerated Number of Failures setting (no re-attempts are made if this setting is 0). 連続エラーの数が [障害の許容数] 設定を上回った場合、そのエンドポイントは異常とマークされます。If the number of consecutive failures is higher than the Tolerated Number of Failures setting, then that endpoint is marked unhealthy. どの場合も、Traffic Manager は複数の場所からプローブし、各リージョン内で連続エラーの判定が行われます。In all cases, Traffic Manager probes from multiple locations and the consecutive failure determination happens within each region. これは、エンドポイントが、[プローブ間隔] に使用されている設定よりも頻繁に Traffic Manager から正常性プローブを受け取ることを意味します。This also means that endpoints are receiving health probes from Traffic Manager with a higher frequency than the setting used for Probing Interval. HTTP または HTTPS 監視プロトコルの場合、エンドポイント側でアプリケーションにカスタム ページ (例: /health.aspx) を実装するのが一般的です。For HTTP or HTTPS monitoring protocol, a common practice on the endpoint side is to implement a custom page within your application - for example, /health.aspx. このパスを監視に使用すると、パフォーマンス カウンターのチェックやデータベースの可用性チェックなどのアプリケーション固有のチェックを実行できます。Using this path for monitoring, you can perform application-specific checks, such as checking performance counters or verifying database availability. これらのカスタム チェックを基にして、ページで適切な HTTP ステータス コードが返されます。Based on these custom checks, the page returns an appropriate HTTP status code. 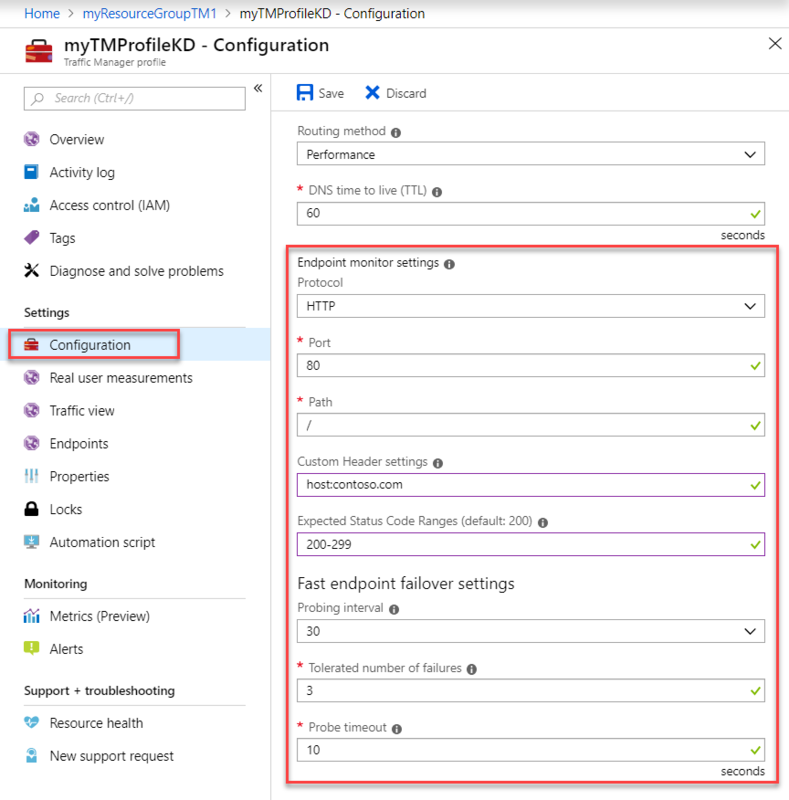 Traffic Manager プロファイルのすべてのエンドポイントは、監視設定を共有します。All endpoints in a Traffic Manager profile share monitoring settings. 複数のエンドポイントに対して異なる監視設定を使用する場合は、 入れ子になった Traffic Manager プロファイルを作成できます。If you need to use different monitoring settings for different endpoints, you can create nested Traffic Manager profiles. Traffic Manager のプロファイルとエンドポイントは、ユーザーが有効と無効を切り替えることができます。You can enable and disable Traffic Manager profiles and endpoints. ただし、Traffic Manager の設定とプロセスを自動化した結果、エンドポイントの状態が変更される場合もあります。However, a change in endpoint status also might occur as a result of Traffic Manager automated settings and processes. 特定のエンドポイントを有効または無効にすることができます。You can enable or disable a specific endpoint. 正常な状態になっている基になるサービスに影響はありません。The underlying service, which might still be healthy, is unaffected. エンドポイントの状態を変更することで、Traffic Manager プロファイルでのエンドポイントの可用性を制御します。Changing the endpoint status controls the availability of the endpoint in the Traffic Manager profile. エンドポイントの状態を無効にすると、正常性はチェックされず、DNS 応答に含まれなくなります。When an endpoint status is disabled, Traffic Manager does not check its health and the endpoint is not included in a DNS response. プロファイルの状態の設定を使用して、特定のプロファイルを有効または無効にすることができます。Using the profile status setting, you can enable or disable a specific profile. エンドポイントの状態が 1 つのエンドポイントに影響を与えるのに対して、プロファイルの状態はすべてのエンドポイントを含むプロファイル全体に作用します。While endpoint status affects a single endpoint, profile status affects the entire profile, including all endpoints. プロファイルを無効にすると、エンドポイントの正常性はチェックされず、DNS 応答にエンドポイントが含まれなくなります。When you disable a profile, the endpoints are not checked for health and no endpoints are included in a DNS response. DNS クエリに対して、NXDOMAIN 応答コードが返されます。An NXDOMAIN response code is returned for the DNS query. DisabledDisabled EnabledEnabled 非アクティブInactive プロファイルは無効にされています。The profile has been disabled. エンドポイントの状態を有効にすることはできますが、プロファイルの状態 (無効) が優先されます。Although the endpoint status is Enabled, the profile status (Disabled) takes precedence. 無効状態のプロファイルに含まれているエンドポイントは監視されません。Endpoints in disabled profiles are not monitored. DNS クエリに対して、NXDOMAIN 応答コードが返されます。An NXDOMAIN response code is returned for the DNS query. <任意><any> 無効Disabled DisabledDisabled エンドポイントは無効にされています。The endpoint has been disabled. 無効状態のエンドポイントは監視されません。Disabled endpoints are not monitored. エンドポイントは DNS 応答に含まれないため、トラフィックを受信しません。The endpoint is not included in DNS responses, therefore, it does not receive traffic. EnabledEnabled EnabledEnabled オンラインOnline エンドポイントは監視されており、正常です。The endpoint is monitored and is healthy. DNS 応答に含めることができるため、トラフィックを受信できます。It is included in DNS responses and can receive traffic. EnabledEnabled EnabledEnabled 低下していますDegraded エンドポイント監視の正常性チェックが失敗しています。Endpoint monitoring health checks are failing. エンドポイントは DNS 応答に含まれないため、トラフィックを受信しません。The endpoint is not included in DNS responses and does not receive traffic. すべてのエンドポイントが低下状態の場合は例外です。この場合、すべてのエンドポイントがクエリの応答で返されると見なされます。An exception to this is if all endpoints are degraded, in which case all of them are considered to be returned in the query response). EnabledEnabled EnabledEnabled エンドポイン トチェック中CheckingEndpoint エンドポイントを監視していますが、最初のプローブの結果をまだ受信していません。The endpoint is monitored, but the results of the first probe have not been received yet. CheckingEndpoint は、プロファイル内のエンドポイントの追加または有効化の直後に通常発生する一時的な状態です。CheckingEndpoint is a temporary state that usually occurs immediately after adding or enabling an endpoint in the profile. この状態のエンドポイントは DNS 応答に含まれるため、トラフィックを受信できます。An endpoint in this state is included in DNS responses and can receive traffic. EnabledEnabled EnabledEnabled 停止済みStopped このエンドポイントが参照するクラウド サービスまたは Web アプリが実行されていません。The cloud service or web app that the endpoint points to is not running. クラウド サービスまたは Web アプリの設定を確認してください。Check the cloud service or web app settings. この状況は、エンドポイントが入れ子になったエンドポイントであり、子プロファイルが無効になっているか非アクティブである場合にも発生する可能性があります。This can also happen if the endpoint is of type nested endpoint and the child profile is disabled or is inactive. 停止状態のエンドポイントは監視されません。An endpoint with a Stopped status is not monitored. DNS 応答に含まれないため、トラフィックを受信しません。It is not included in DNS responses and does not receive traffic. すべてのエンドポイントが低下状態の場合は例外です。この場合、すべてのエンドポイントがクエリの応答で返されると見なされます。An exception to this is if all endpoints are degraded, in which case all of them will be considered to be returned in the query response. 入れ子になったエンドポイントのエンドポイント監視の状態を計算する方法の詳細については、「入れ子になった Traffic Manager プロファイル」を参照してください。For details about how endpoint monitor status is calculated for nested endpoints, see nested Traffic Manager profiles. エンドポイント モニターの停止状態は、Web アプリケーションが Standard レベル以上で実行されていない場合に App Service で発生することがあります。A Stopped Endpoint monitor status can happen on App Service if your web application is not running in the Standard tier or above. 詳細については、Traffic Manager と App Service の統合に関するページを参照してください。For more information, see Traffic Manager integration with App Service. DisabledDisabled <いずれも> または、プロファイルでエンドポイントが定義されていません。<any> or a profile with no defined endpoints. DisabledDisabled プロファイルは無効にされています。The profile has been disabled. EnabledEnabled 少なくとも 1 つのエンドポイントの状態が低下です。The status of at least one endpoint is Degraded. 低下していますDegraded 個々のエンドポイントの状態の値を確認し、さらなる注意が必要なエンドポイントを特定します。Review the individual endpoint status values to determine which endpoints require further attention. EnabledEnabled 少なくとも 1 つのエンドポイントの状態がオンラインです。The status of at least one endpoint is Online. 低下の状態になっているエンドポイントがありません。No endpoints have a Degraded status. オンラインOnline サービスをトラフィックを受信しています。The service is accepting traffic. ユーザーによる対処は不要です。No further action is required. EnabledEnabled 少なくとも 1 つのエンドポイントの状態が、エンドポイント チェック中です。The status of at least one endpoint is CheckingEndpoint. オンラインまたは低下のエンドポイントはありません。No endpoints are in Online or Degraded status. エンドポイント チェック中CheckingEndpoints このトラフィックの状態は、プロファイルが作成されるか有効になったときに発生します。This transition state occurs when a profile if created or enabled. エンドポイントの正常性が初めてチェックされます。The endpoint health is being checked for the first time. EnabledEnabled プロファイルで定義されているすべてのエンドポイントの状態が無効または停止のいずれかであるか、プロファイルにエンドポイントが定義されていません。The statuses of all endpoints in the profile are either Disabled or Stopped, or the profile has no defined endpoints. 非アクティブInactive アクティブなエンドポイントはありませんが、プロファイルは引き続き有効です。No endpoints are active, but the profile is still Enabled. Traffic Manager は、問題のあるエンドポイントを含むすべてのエンドポイントの正常性を定期的にチェックします。Traffic Manager periodically checks the health of every endpoint, including unhealthy endpoints. Traffic Manager は、エンドポイントが正常な状態になり、ローテーションに帰ったときに検出します。Traffic Manager detects when an endpoint becomes healthy and brings it back into rotation. 200 以外の応答、または予測される状態コード範囲設定で指定された状態範囲を含まない応答を受信した (別の 2xx コードまたは 301/302 リダイレクトを含む)。A non-200 response, or a response that does not include the status range specified in the Expected status code ranges setting, is received (including a different 2xx code, or a 301/302 redirect). 接続を確立するために Traffic Manager が送信した SYNC 要求に対して、ACK または SYN-ACK 以外の応答を受信した。A response other than ACK or SYN-ACK is received in response to the SYNC request sent by Traffic Manager to attempt a connection establishment. その他の接続の問題によってエンドポイントに到達できない。Any other connection issue resulting in the endpoint being not reachable. 失敗したチェックのトラブルシューティングについての詳細については、「 Azure Traffic Managerでの機能低下状態のトラブルシューティング」を参照してください。For more information about troubleshooting failed checks, see Troubleshooting Degraded status on Azure Traffic Manager. 次の図のタイムラインは、監視プロトコルが HTTP、プローブ間隔が 30 秒、障害の許容数が 3、タイムアウト値が 10 秒、DNS TTL が 30 秒にそれぞれ設定された Traffic Manager エンドポイントの監視プロセスの詳細を示しています。The timeline in the following figure is a detailed description of the monitoring process of Traffic Manager endpoint that has the following settings: monitoring protocol is HTTP, probing interval is 30 seconds, number of tolerated failures is 3, timeout value is 10 seconds, and DNS TTL is 30 seconds. GET。GET. エンドポイントごとに、Traffic Manager の監視システムは、監視設定で指定されたパスで GET 要求を実行します。For each endpoint, the Traffic Manager monitoring system performs a GET request on the path specified in the monitoring settings. 200 OK または Traffic Manager プロファイル監視設定で指定されたカスタム コード範囲。200 OK or custom code range specified Traffic Manager profile monitoring settings . 監視システムでは、HTTP 200 OK または Traffic Manager プロファイル監視設定で指定されたカスタム コード範囲のメッセージが 10 秒以内に返されると想定しています。The monitoring system expects an HTTP 200 OK or the or custom code range specified Traffic Manager profile monitoring settings message to be returned within 10 seconds. この応答を受信すると、サービスが使用可能であると認識されます。When it receives this response, it recognizes that the service is available. 30 秒間隔のチェック。30 seconds between checks. このエンドポイント正常性チェックは 30 秒ごとに繰り返されます。The endpoint health check is repeated every 30 seconds. サービス利用不可。Service unavailable. サービスが使用できなくなります。The service becomes unavailable. Traffic Manager は、次の正常性チェックまで使用可能になったことを認識しません。Traffic Manager will not know until the next health check. 監視パスへのアクセス試行。Attempts to access the monitoring path. 監視システムは GET を実行していますが、タイムアウト期間である 10 秒以内に応答が返されていません (または、200 以外の応答が受信されている場合があります)。The monitoring system performs a GET request, but does not receive a response within the timeout period of 10 seconds (alternatively, a non-200 response may be received). 次に、監視システムは、30 秒間隔で、さらに 3 回試行します。It then tries three more times, at 30-second intervals. 3 回の試行のいずれかが成功した場合、試行の回数はリセットされます。If one of the tries is successful, then the number of tries is reset. 機能低下として指定。Status set to Degraded. 4 回連続して失敗した後に、監視システムは、利用できないエンドポイントの状態を低下として指定します。After a fourth consecutive failure, the monitoring system marks the unavailable endpoint status as Degraded. 他のエンドポイントへのトラフィックの転送。Traffic is diverted to other endpoints. Traffic Manager DNS ネーム サーバーが更新され、Traffic Manager による DNS クエリへの応答でこのエンドポイントが返されなくなります。The Traffic Manager DNS name servers are updated and Traffic Manager no longer returns the endpoint in response to DNS queries. そのため、新しい接続は他の使用可能なエンドポイントに転送されます。New connections are directed to other, available endpoints. ただし、以前の DNS 応答にこのエンドポイントが含まれていて、その応答が再帰 DNS サーバーや DNS クライアントにキャッシュされている場合があります。However, previous DNS responses that include this endpoint may still be cached by recursive DNS servers and DNS clients. クライアントは、DNS キャッシュの有効期限が切れるまでこのエンドポイントの使用を継続します。Clients continue to use the endpoint until the DNS cache expires. DNS キャッシュが期限切れになり、クライアントが新たに DNS クエリを実行すると、他のエンドポイントに転送されます。As the DNS cache expires, clients make new DNS queries and are directed to different endpoints. キャッシュ期間は、Traffic Manager プロファイルの TTL 設定によって制御され、30 秒などに設定されています。The cache duration is controlled by the TTL setting in the Traffic Manager profile, for example, 30 seconds. 正常性チェックの続行。Health checks continue. Traffic Manager は、低下状態にある間も、エンドポイントの正常性を継続的にチェックします。Traffic Manager continues to check the health of the endpoint while it has a Degraded status. 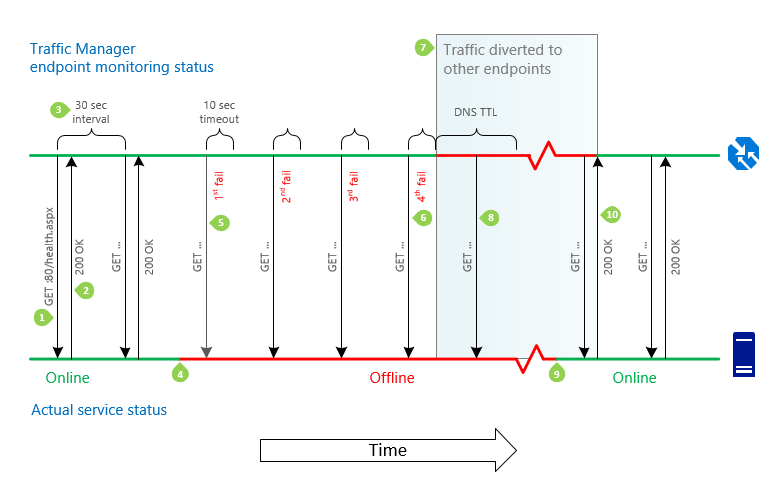 Traffic Manager は、稼働状態に戻ったときにエンドポイントを検出します。Traffic Manager detects when the endpoint returns to health. サービスがオンラインに復帰。Service comes back online. サービスが使用できるようになります。The service becomes available. 監視システムが次の正常性チェックを実行するまで、Traffic Manager ではエンドポイントは低下状態のままです。The endpoint retains its Degraded status in Traffic Manager until the monitoring system performs its next health check. サービスへのトラフィックの再開。Traffic to service resumes. Traffic Manager は、GET 要求を送信し、200 OK ステータス応答を受け取ります。Traffic Manager sends a GET request and receives a 200 OK status response. サービスが正常な状態に戻りました。The service has returned to a healthy state. Traffic Manager のネーム サーバーがもう一度更新され、DNS 応答でサービスの DNS 名の配信が開始されます。The Traffic Manager name servers are updated, and they begin to hand out the service's DNS name in DNS responses. 他のエンドポイントに返されているキャッシュ済みの DNS 応答が期限切れになり、他のエンドポイントとの既存の接続が終了すると、トラフィックは元のエンドポイントに戻ります。Traffic returns to the endpoint as cached DNS responses that return other endpoints expire, and as existing connections to other endpoints are terminated. Traffic Manager は DNS レベルで動作するため、いずれかのエンドポイントとの既存の接続に影響を与えることはありません。Because Traffic Manager works at the DNS level, it cannot influence existing connections to any endpoint. (プロファイル設定を変更するか、フェールオーバーまたはフェールバックが発生して) エンドポイント間でトラフィックが送信される際、新しい接続は Traffic Manager によって使用可能なエンドポイントに転送されます。When it directs traffic between endpoints (either by changed profile settings, or during failover or failback), Traffic Manager directs new connections to available endpoints. ただし、他のエンドポイントは、セッションが終了するまで既存の接続を介してトラフィックを受信し続ける可能性があります。However, other endpoints might continue to receive traffic via existing connections until those sessions are terminated. トラフィックが既存の接続に転送されないようにするには、各エンドポイントで使用されるセッション期間をアプリケーションで制限する必要があります。To enable traffic to drain from existing connections, applications should limit the session duration used with each endpoint. エンドポイントが、機能低下状態になっているときは、DNS クエリに対する応答でエンドポイントが返されなくなります。When an endpoint has a Degraded status, it is no longer returned in response to DNS queries. 代わりに別のエンドポイントが選択されて返されます。Instead, an alternative endpoint is chosen and returned. プロファイルで構成されているトラフィック ルーティング方法によって、代替のエンドポイントの選択方法が決定されます。The traffic-routing method configured in the profile determines how the alternative endpoint is chosen. 優先順位。Priority. エンドポイントの優先度リストが使用されます。Endpoints form a prioritized list. 常に、リスト内で最初に使用可能なエンドポイントが返されます。The first available endpoint on the list is always returned. エンドポイントが低下状態になると、次に使用可能なエンドポイントが返されます。If an endpoint status is Degraded, then the next available endpoint is returned. 重み付け使用可能なエンドポイントのいずれもが返される可能性があります。Weighted. 選択は、割り当てられた重みと、他の使用可能なエンドポイントの重みに基づき、ランダムに行われます。Any available endpoint is chosen at random based on their assigned weights and the weights of the other available endpoints. パフォーマンス。Performance. エンド ユーザーに最も近いエンドポイントが返されます。The endpoint closest to the end user is returned. そのエンドポイントが使用できない場合、Traffic Manager は、次の最も近い Azure リージョン内のエンドポイントにトラフィックを移動します。If that endpoint is unavailable, Traffic Manager moves traffic to the endpoints in the next closest Azure region. パフォーマンス トラフィック ルーティング方法では、入れ子になった Traffic Manager プロファイルを使用してフェールオーバー計画を構成することもできます。You can configure alternative failover plans for performance traffic-routing by using nested Traffic Manager profiles. 地理的。Geographic. クエリ要求の IP に基づいて地理的な場所を提供するためにマップされたエンドポイントが返されます。The endpoint mapped to serve the geographic location based on the query request IP’s is returned. 地理的な場所はプロファイル内の 1 つのエンドポイントにしかマップできないため、そのエンドポイントが使用できない場合に、フェールオーバー先として別のエンドポイントは選択されません (詳細については、FAQ をご覧ください)。If that endpoint is unavailable, another endpoint will not be selected to failover to, since a geographic location can be mapped only to one endpoint in a profile (more details are in the FAQ). ベスト プラクティスとして、地理的なルーティングを使用する場合は、プロファイルのエンドポイントとして複数のエンドポイントが含まれた入れ子になった Traffic Manager プロファイルを使用することをお勧めします。As a best practice, when using geographic routing, we recommend customers to use nested Traffic Manager profiles with more than one endpoint as the endpoints of the profile. 複数値。IPv4/IPv6 アドレスにマップされている複数のエンドポイントが返されます。MultiValue Multiple endpoints mapped to IPv4/IPv6 addresses are returned. このプロファイルに対するクエリが受信されると、正常なエンドポイントが、指定した応答内の最大レコード数の値に基づいて返されます。When a query is received for this profile, healthy endpoints are returned based on the Maximum record count in response value that you have specified. 応答の既定の数は 2 つのエンドポイントです。The default number of responses is two endpoints. サブネット。一連の IP アドレス範囲にマップされたエンドポイントが返されます。Subnet The endpoint mapped to a set of IP address ranges is returned. その IP アドレスから要求を受信した場合、返されるエンドポイントは、その IP アドレスにマップされているものです。When a request is received from that IP address, the endpoint returned is the one mapped for that IP address. 詳細については、「 Traffic Manager のトラフィック ルーティング方法」を参照してください。For more information, see Traffic Manager traffic-routing methods. トラフィック ルーティングの通常の動作の 1 つの例外は、すべての対象となるエンドポイントが低下状態になった場合に発生します。One exception to normal traffic-routing behavior occurs when all eligible endpoints have a degraded status. この場合、Traffic Manager は、"ベスト エフォート" として、低下状態のすべてのエンドポイントが実際にはオンラインであるかのように応答します。Traffic Manager makes a "best effort" attempt and responds as if all the Degraded status endpoints actually are in an online state. この動作は、DNS 応答でどのエンドポイントも返されないよりは望ましい手段です。This behavior is preferable to the alternative, which would be to not return any endpoint in the DNS response. 無効または停止状態のエンドポイントは監視されないため、トラフィックの対象と見なされません。Disabled or Stopped endpoints are not monitored, therefore, they are not considered eligible for traffic. アクセス制御リスト (ACL) が Traffic Manager の正常性チェックをブロックしている。An access control list [ACL] blocking the Traffic Manager health checks. Traffic Manager プロファイルで監視ポートまたは監視プロトコルが正しく構成されていない。An improper configuration of the monitoring port or protocol in the Traffic manager profile. どのエンドポイントも返されない場合、Traffic Manager の正常性チェックが正しく構成されていなくても、トラフィック ルーティングの観点では Traffic Manager が正常に動作 している ように見える場合があります。The consequence of this behavior is that if Traffic Manager health checks are not configured correctly, it might appear from the traffic routing as though Traffic Manager is working properly. ただし、この場合、エンドポイントのフェールオーバーが行われず、アプリケーション全体の可用性に影響を与えます。However, in this case, endpoint failover cannot happen which affects overall application availability. プロファイルに低下状態ではなくオンライン状態を表示することが重要になります。It is important to check that the profile shows an Online status, not a Degraded status. オンライン状態は、Traffic Manager の正常性チェックが正常に動作していることを示しています。An Online status indicates that the Traffic Manager health checks are working as expected. 失敗した正常性チェックのトラブルシューティングについての詳細については、「 Azure Traffic Managerでの機能低下状態のトラブルシューティング」を参照してください。For more information about troubleshooting failed health checks, see Troubleshooting Degraded status on Azure Traffic Manager.